Battle Chasers: Nightwar is a new twist on the classic turn-based RPGs that we love so fondly. Reminiscent of Final Fantasy (and other) JRPG titles, Nightwar is filled with story, exploration, and classic turn-based combat. Yet Nightwar stands apart from these titles with its mixture of action RPG elements, a crafting system, and character role establishment, including character pathways with role-boosting perks and unique skills. If you enjoy the turn-based RPG model, then you’ll love this new spin. Nightwar combines the two different RPGs -- action and turn-based -- to create a new way to play the traditional turn-based RPG. This includes dungeons-diving, combat role specialization, and crafting. However, some of these elements aren’t available until you reach a certain level. This creates a situation where the title doesn’t really become enjoyable until you’ve given it a couple hours of gameplay. While Nightwar starts off slow, both in story and combat, once you reach Level 5 and your first full dungeon, the mechanics change. These changes make the game more involved, more strategic, and more fun. They also add new character customization options and, eventually, character artifacts that enhance the RPG gameplay, mixing in more action-RPG elements. While most turn-based RPGs do not allow for role specialization and are based on static DPS or healing roles and abilities, Nightwar lets the player specialize their characters to create a tanking mechanic that allows one character to draw more of the damage. This a major improvement on the turn-based action system, where previously these titles only allowed the strategy of crossing your fingers that your healer or DPS characters don’t take the heavy hits through bad RNG luck. This finger-crossing strategy is common in Final Fantasy VII-X, Super Mario RPG, and Dragon’s Quest. These titles, although early in the genre's history, still serve as the standard. However, since they afforded zero-to-minimal character customization features (outside of simple level grinding and gear swapping), gameplay devolved to a single, basic, defeat-all strategy: if you can’t beat the boss, go level up some more. Using the new tank mechanics lets you strategize and prolong a fight by employing damage mitigation and damage specialization, so you don’t have to rely on RNG to keep your weaker characters from being annihilated. 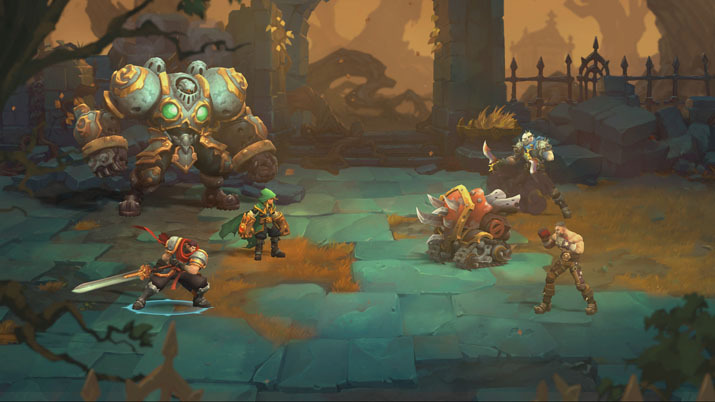 Battle Chasers: Nightwar starts off slow and doesn’t seem any different than other RPGs. In the beginning, while the story is mildly entertaining, Nightwar lacks the element of choice in character development, which is frustrating in RPGs. The only choices you have are what items you equip. Some good turn-based games allow you to make choices in how your character(s) develop as they progress through the game and level up, such as Super Mario RPG. Additionally, you are limited in dungeon-diving for the first few levels. However, there are mini-dungeons, or dungeon-like areas, where you explore additional maps and fight more mobs. These encounters are also turn-based, and beating them allows you to grind out XP and attain more equipment. This slow start is Nightwar’sbiggest downfall; unless you are interested in the story, there isn’t much to keep you playing. Personally, I didn’t see why Nightwar was unique and worth playing when I could revert to my favorite turn-based RPGs. However, I pushed through and discovered it was completely worth it at Level 5. Crafting items is more fun than grinding them. Not every RPG includes a crafting system that allows you to create your own potions and other items, giving Nightwar a different way to play outside of grinding for new health or mana potions. Once you reach the first town, you are introduced to an alchemist, an enchanter, and a blacksmith. These NPCs, in turn, provide crafting quests, stores where you can buy materials, and a place to craft items. As you interact with the NPCs, they get to know you better, which in turn lowers their prices for materials. You can also spend money to upgrade the stores, further enhancing your crafting abilities. Crafting an item isn’t your typical follow-a-base-recipe experience, either. While there are recipes to follow, you don’t have to provide all the ingredients. However, using all the ingredients gives you a 100% chance of making the item. The fewer ingredients you use, the less of a chance you have to make the item. This mechanic is still handy, though, as you can gamble when you want or can’t find the final quantity of a certain material. In addition to crafting, Nightwar has fishing, which can be fun and frustrating at the same time. After you cast your line and catch a fish, you have to pull the line opposite of the direction the fish is swimming and then drag the fish to the shore by your character. This can be difficult due to the camera angle as you may not always know which direction the fish is trying to swim – it’s much easier to try to catch fish closer to the shore as you won’t have to pull against the fish as long. Another fun system outside of gameplay is provided by the Beast Master in the main town (with the crafting NPCs). This beast master teaches you about monsters the more you fight them, letting you discover their abilities, health, and mana as you combat them. She will also send you on monster hunts that allows you to gain unique item mats for crafting. 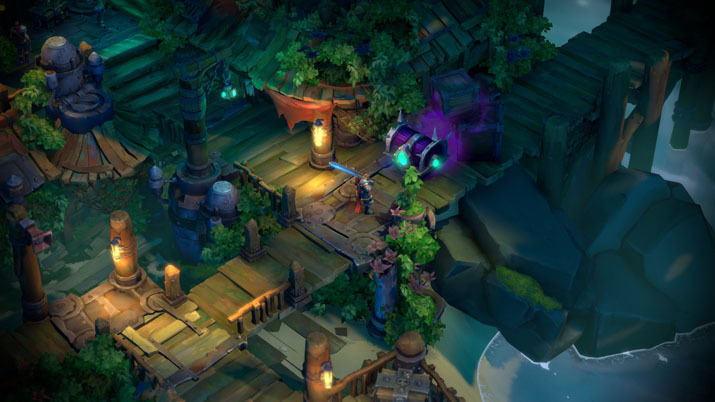 Battle Chasers: Nightwar has a moderately interactive map. Nightwar’smap is interactive. As you travel along the different routes, the map shows you where enemy encounters are and where loot is. You can pick up the loot as you move across the map, meaning you don’t have to leave the map to explore the area for the loot. This simplifies some of the crafting material gathering, and you always know when you are going to hit a mob, which sometimes allows you to avoid encounters if your team is low on health. Besides enemies and loot marked on the map, there are cannons that fire at you. You need to avoid the cannon fire, which isn’t too difficult: you just have to keep moving and not pause with bad timing. 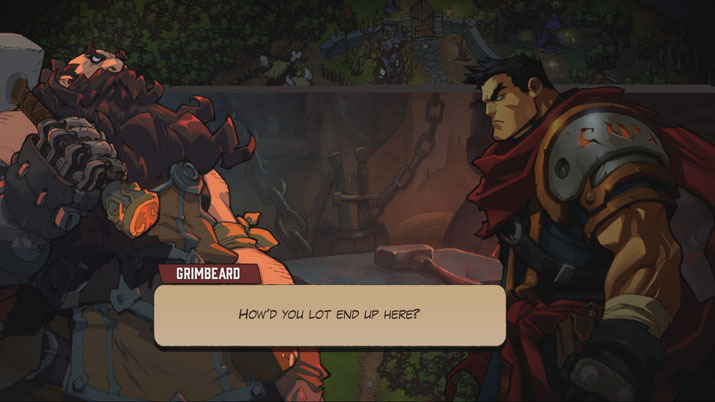 With an interactive map, crafting, and action RPG elements, Battle Chasers: Nightwar presents a new twist on the classic turn-based RPG games that we love. If you can just push through the slower first few levels, Nightwar ’s mechanics blossom into something more engaging and strategic. If you like RPGs, this isn’t one you want to miss out on.